This Beautiful APART-VILLA carefully furnished you will offer a Beautiful LUNCHROOM - LIVING-ROOM of 60m2 with Air-conditioning , Wifi ,TV of 120 cm , a Large Sofa , two leather armchair + a KITCHEN all equiped , a diswasher , washing machine + BEAUTIFUL BEDROOM Very Cosy , all natural wood of 12 m2 with a Bed for 2ps < excellent bedding , garantee Great comfort > + LOVELY BATHROOM a Large shower ,a washbasin + BEAUTIFUL TERRACE of 25m2 with a table for lunch outside , Barbecue , Garden Furniture + independent with a PRIVATE ENTRACE + PARKING IN THE YARD closed with a portal + to only 200 METERS WALK ALL SHOPS , the Bakeries , butcher's shop , Banks , Supermarkets , Restaurants , Bars , and anothers shops + TO ONLY FEW MINUTES FROM AVIGNON and of STATION TGV+ TO ONLY 1 KILOMETER OF THE MOTORWAY A7 ( take the exit n°23 Avignon ) a exceptional location for visiting the Provence to foot , in bike , in car ! to Proximity the Beautiful Markets of Provence : Isles sur la Sorgues , Bédoin , Saint-Rémi de Provence , The Vaucluse offer an incredible wealth with its sites Naturals and its important Historical heritage : Avignon , le Pont d'Avignon , le Palais des Papes , Isle sur Sorgues , Carpentras , Nîmes , Arles , Orange, Fontaine de Vaucluse , Saint-Rémi de Povence , les Baux , Vaison la Romaine , Chateauneuf du Pape ; Le Pont du Gard , le Luberon , Gordes , Ménerbe , le Roussillon , Le Mont-Ventoux, La Camargue ! Thank you Gail and David , yes ! it's the second time you comme tous in our lovely apartmentin Provence ! 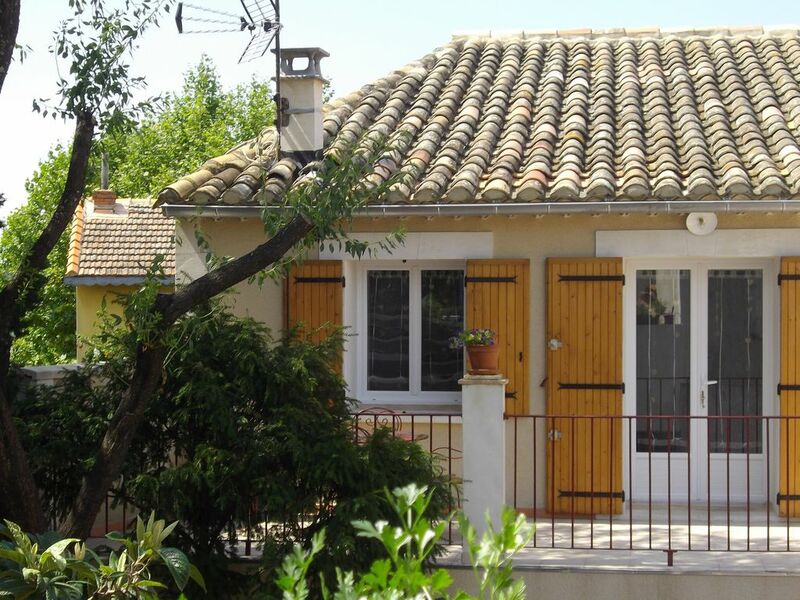 An open, spacious accommodation in the small town of Vedene, just outside of Avignon. Emilio remodeled the apartment beautifully. He is really a master craftsman. The loft bedroom has a comfortable double bed. The steps to the loft are a bit steep though I had no problem getting up and down. The location is ideal. Easy access to Avignon, L'isle du la Sorgue, Nimes, Orange, small towns in Luberon. Despite their limited English, Sonia and Emilio were wonderful hosts. This is a great value and I would highly recommend it. Sonia and Emilio have created a lovely apartment in the heart of Vedene. It is well equipped, comfortably furnished and beautifully clean, with a feature mezzanine bedroom (with extremely comfortable bed!). We thoroughly enjoyed our stay here and especially loved our barbecues on the terrace (which is even better than in the featured picture, as Emilio has now put up a fence, which creates a very private area for guests). The kitchen facilities are good, with hob, fridge freezer, washing machine and dishwasher (no oven though). Parking is secure within the grounds and with a locked gate. Sonia and Emilio are lovely people, who make you feel really welcome and who go out of their way to be helpful. We especially enjoyed receiving our 'daily email' from Sonia, containing suggestions of where to visit in the area. Thanks to her suggestions, we saw lots of beautiful places, such as Les Baux, L'Isle-sur-la-Sorgue, Avignon, Pont du Gard etc. Would thoroughly recommend this apartment. What a beautiful comment on your vacation in Provence ! The Perfect Place in Provence! This charming appart-villa is spotlessly clean, spacious, modern and very comfortable. The location is perfect for exploring the region and visiting the sights, cities and points of interest in Provence. And what a pleasure to return 'home' at the end of the day and be able to prepare a delicious meal in the fully equipped kitchen and to be able to relax in the tastefully decorated living room. The owners, Sonia and Emilio, are an absolute delight - so kind, friendly and helpful. We thoroughly enjoyed getting to know them. We had a wonderful time here and highly recommend it as a great place to stay. We stayed for 4 nights in Vedene (early May) and found it to be better than described! The apartment had everything you would need, although we missed out on the internet by one day. Emilio's design of a loft bedroom, in the middle of the apartment, is terrific but I would recommend a hand rail for the less able! Everything else about the apartment (parking, kitchen, bathroom, etc) was great and made it a pleasure to return home after a day sight-seeing. From Vedene it was easy to get to Avignon, Pont-Du-Gard, Orange (brilliant Roman theatre) and greater Provence. But the best part was the hospitality offered by Sonia and Emilio. Even with their limited English (which is much better than our French!) they convey a warm and welcoming feeling that makes the stay so enjoyable. Quel beau logement et quelles belles personnes ! Nous sommes arrivés de Belgique après avoir déjà eu quelques gentils contacts téléphoniques ainsi que des courriels avec la propriétaire Sonia, nous n'arrivions donc pas en terre inconnue le soir pluvieux de notre arrivée. Emilio, le mari de Sonia, nous attendait sur le trottoir sous la pluie battante depuis longtemps, à mon avis, pour nous accueillir et être certain que nous ne rations pas le portail du gite. Nous avons directement été mis en confiance par nos hôtes et les explications techniques de notre logement nous furent données dans la foulée. Sonia a mis à notre disposition une farde avec tout ce qu'il fallait savoir sur le gite et les commerces à proximité. Nous avons aussi pu bénéficier de guides et de cartes pour visiter la Provence. Nous sommes restés tous les jours en contact via courriel avec Sonia qui nous donnait des "tuyaux" sur ce que l'on pouvait visiter et sur la météo......Tout s'est donc passé magnifiquement pour tout notre séjour dans cette belle région. Nous resterons en contact avec ces personnes plus que sympathiques . En conclusion, une adresse à retenir . oh oui ! le jour de votre arrivée il pleuvait , mais Nous sommes contents quand ce mois de novembre vous ayez pu profiter des températures douces et des belles journées ensoleillées pour visiter la Provence et que vous ayez apprécié notre joli Gîte , Vous êtes une petite famille formidable , encore merci pour les bons chocolats Belges !